Today's pick of the week is Style 2800 from the Dessy Collection line. Made of nu-georgette fabric, this Fortuny pleated dress is sure to garner plenty of compliments! The hand-worked flower is an exquisite touch, and pairing it with large semi-precious stone earrings will have you stepping out like a true fashionista. And what is Fortuny pleating you ask? Well, I was curious myself, and it turns out that it is named after a designer named Mariano Fortuny from the early 1900's who invented the unique way to make crisp pleats in silk fabric. 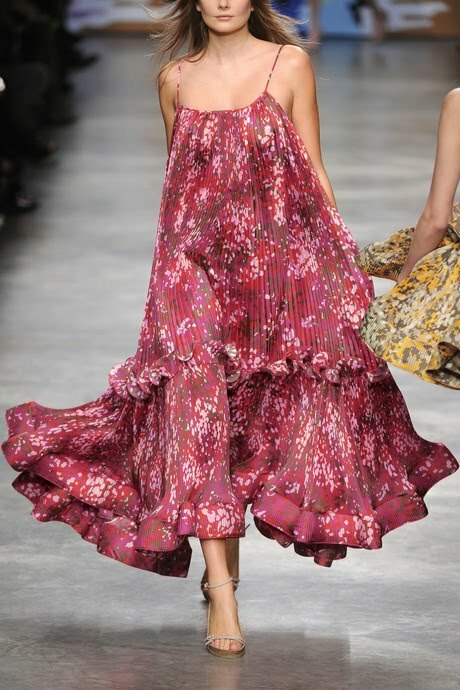 You may have also seen this type of pleating in scarves and Stella McCartney's maxi dresses.